South Goa's Patnem beach is a small idyllic stretch of sand just south of Palolem beach. Visitors here are quickly sold on the unhurried pace, excellent beach shacks and stunning scenery that make Patnem so special. Many return year after year. Patnem is one of Goa's best beaches for children since the nightlife is low-key, the food is varied and high quality and the sea is relatively calm (though tides can be high at full moon). For those that feel adventurous, there are miles of stunning beaches to explore to the south. For those that do not, there are dolphins to look out for on the horizon. Sample The Food I think that the shacks on Patnem are some of the best in Goa, with extensive menus and high quality food. Home, the Swiss/British run cafe is especially good. Explore Nearby Beaches Taking a walk south from Patnem leads you to a string beaches, many of which are on a scenic diversion off the tourist track. See more information below. Party In Palolem With Palolem in short walking distance (to the north) you can dip in and out of the livelier scene that this well known south Goan beach offers. Magic Cinema Look out for films showing at the al fresco cinema which seems to appear in a different location every year (as its name perhaps suggests!). Margao is the gateway to south Goa, and trains (3 per day) and buses (frequent) run from here to the south Goan town of Chaudi. From Chaudi it is a short rickshaw ride / bus journey on to Patnem / Palolem beach. If you alight in Palolem, a rickshaw to Patnem beach should cost a minimal amount. It is possible to get a direct bus from Margao to Palolem, and if the bus is continuing on, it is worth checking if it stops at Patnem. If not, a rickshaw ride will complete your journey. The bus stop in Patnem is on the road running parallel and inland to the beach. Note that buses are infrequent, and the last bus towards Chaudi / Margao leaves around 4pm, though you should always check with locals as times vary year to year. Prices in Patnem beach are rising year by year, and peak season can see further price hikes. 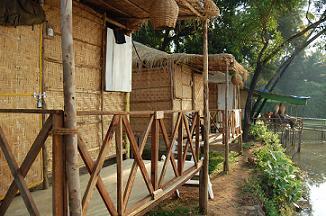 Most of the accommodation takes the form of beach front huts with varying amenities and levels of comfort. Staying in early November before the season kicks off can save budget travellers some money, or taking hut accommodation in nearby Palolem where the prices are slightly lower. Visitors can expect to pay around R.600 - R.1500 per night, but remember, this is Goa, and it is always worth trying to cut a deal. Longer stays can equal lower rates, and the first price quoted can often be brought down a little. Of the budget places in Patnem, try Shiva where huts are priced around the R.300 mark. If you are travelling in a group or couple, consider sending off a 'scout party' to enquire at a few places while someone watches the bags. Always try to get somewhere with a mosquito net, or with hooks where you can attach your own. Money changers are clustered around the small street that leads down to Patnem beach, but as of yet the nearest cash machine is in Chaudi, a rickshaw ride away. The fare should be minimal, as Chaudi is only 2km from nearby Palolem - and don't let anyone tell you otherwise! Internet cafes are plentiful on the road or in many of the beach shacks. There is also no shortage of travel agents in Patnem and nearby Palolem. Supplies that can not be obtained in Patnem can usually be bought in Chaudi, though shops on the beach road sell an array of toiletries, sun protection, snacks and mosquito protection. Head to the southern end of Patnem beach at low tide and you will reach Rajbag beach. Its luxury hotel, the Goa Grand International is about the only structure on this long stretch of white sand. A small but deep stream divides Rajbag from the next beach further south - you can arrange with local fishermen to take you across, but it is wise to hold back some of what you decide to pay until you have completed your return journey. Taplona beach is a fishing spot, and you are likely to see nets drying in the sun. Continue south past a few small villages to Galjibag beach where a couple of shacks sell refreshments. This romantic looking beach is backed by fir trees, and is a nesting ground for Olive Ridley marine turtles in early November. If you do this walk, take plenty of sun protection and water, as there are few amenities along the way, and the sun is fierce. It is possible to return from Galjibag along the main roads inland - you may be able to arrange a rickshaw with one of the shack owners. 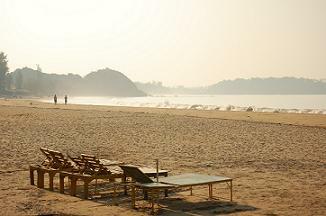 Let us know your favourite Goa beach and we will publish it on our site! Visit the Hindu pilgrimage town of Gokarna in neighbouring Karnataka state to deepen your experience of India / begin your travels south. Twice daily trains and buses leave from Chaudi. Help us find the best beach shacks in Goa by publishing a review of your favourite shack on our site! The old capital of Portuguese Goa with its stunning 16th and 17th Century architecture is a great day trip away from the beach. Catch the carnival or visit the colourful market in the busy north Indian town of Mapusa. Redi Fort is just over the Goan border in Maharashtra. The remains of this crumbling Fort, reclaimed by the jungle are well off the tourist route.